Acupuncture is comfortable, natural healing method. Acupuncture is a safe and effective alternative to medication used to treat people of all ages, from seniors to children. Acupuncture treatment in Saskatoon at Movement Chiropractic is part of our integrated approach to patient care. Dr. Russell specializes in the art and science of acupuncture therapy, having received formal recognition of his skills by the Acupuncture Foundation of Canada. Acupuncture is a well-researched system of health care that uses special, “hair-like” needles. This drug-free therapy is used to help the body heal, reduce or eliminate chronic pain and improve overall functioning. This includes back pain, muscle aches, sports injuries, headaches and many other conditions. Acupuncture has been in existence for over 5,000 years. 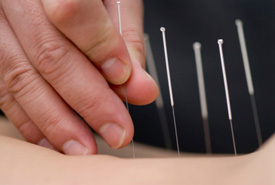 During acupuncture treatment needles are gently inserted into specific sites on the body. These body locations are part of a network of points called meridians. Meridians are thought to be the pathways which energy, or Qi (pronounced chee), flows within the body. Often acupuncture has a calming or relaxing effect, which many patients regard as a welcome side effect of treatment. Generally, when inserted by a skilled acupuncture practitioner, there’s little or no discomfort. Frequently, patients ask if the needles have been placed yet, because they can’t feel them! Occasionally people sense heaviness or slight sharpness at the insertion site, which quickly goes away. In the majority of cases, the experience is relaxing, often leading to patients falling asleep. If you’re nervous at all about acupuncture, let us know. We’ll simply insert a minimal number of needles, just for you to experience relaxation. Most people are surprised when they see how very thin acupuncture needles are: the diameter of a human hair. Another tip: just don’t look at the needle while it’s being inserted! If you’re interested in receiving acupuncture in Saskatoon, we’ll have you fill out a specific form so that Dr. Russell can discuss your condition to determine if acupuncture treatment is right for you. Each visit is usually between 30 and 50 minutes and rates can be found here. We encourage you to wear treatment-appropriate attire (example: a tank top and shorts). Acupuncture has become a very popular adjunct therapy for chiropractic patients! Contact us today for a convenient acupuncture appointment. Visit our Rates page for complete pricing information. Direct billing is available.